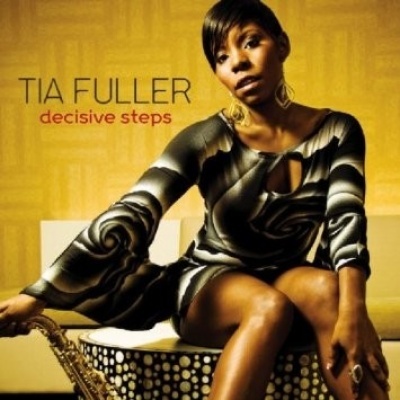 Tia Fuller's time on the road with pop superstar Beyoncé Knowles has to be as profitable a venture as anyone could dream of, yet she returns to the modern mainstream of contemporary jazz with this third CD, whose title, Decisive Steps, assures everyone where her true heart lies. While alto saxophonist Fuller loves her straight-ahead bop, she's open to Brazilian music, a little funk but not too much, and she enjoys mixing it up with superstars like Christian McBride, rising star vibraphonist Warren Wolf, or fellow Mack Avenue labelmate, trumpeter Sean Jones. Fuller's core group is all female, with sister/pianist Shamie Royston on keyboards, the fine bassist Miriam Sullivan, and drummer Kim Thompson, and they clearly play well together as a unit. Bookended by bop tracks like the smoking title track and a roaring version of "My Shining Hour," Fuller paints broadly brushed strokes in complete tandem with Jones and Royston's tip-toe piano on the 6/8 in 4/4 "Windsoar," in R&B style, adding Fender Rhodes for the retro "Ebb & Flow," and picking up a flute for the most delightful waltz, "Night Glow." Wolf and McBride appear on two tracks that broaden Fuller's horizon into neo-bop, a style that she should explore more, as the acclaimed bassist has. This is a very well-conceived and consistently good album, not a magnum opus, but it indicates she's well on her way to producing a great modern jazz album in the not-too-distant future.